FIRST DELETE ANY PREVIOUS VERSIONS OF THE MOD! Note the “MA” at the end. That is the mod folder. Don’t forget to add that if you change the directory! Do NOT install the mod directly into your FF directory, as it won’t work and it will likely mess up your game installation. Some anti-virus programs will find false positives on the .exes of this mod. These are nothing but batch files I compiled myself, but because they copy and replace the campaign files in the background in order to switch campaigns out, AV programs tend to freak out about them. If this makes you uncomfortable, feel free to use the included shortcut instead and switch the campaigns manually as outlined below. Saves during missions will load, but the mission will not work properly once loaded. This is the nature of EZScript, and I’m afraid I can’t do anything about it. It is best to save between or after missions. You won’t see balance and other fixes unless you start new campaigns. That’s just the nature of FF’s saves; they carry a snapshot of everything, so no changes will show up in old campaigns unless you restart them. That’s one of the reasons I’m including saves. If you’ve got certain video card and driver combinations, certain characters, like Iron Man, may have helmets/hats/hair that bob up and down on their heads when you have full video settings. Just turn off character shadows and that will stop. The game suffers rare CTDs in Windows 8 and 10. I have no idea what’s causing these, and they are likely just a result of the game not playing entirely nicely with new versions of Windows. The crashes aren’t reliably recreatable, so I don’t have much information. They don’t seem to harm anything, but be aware and don’t panic if it happens. The dreaded pink texture issue seems to have reared its head again. This is when part or all of a character’s textures show up bright pink. It is apparently being caused by the number of similar meshes/skins that the mod contains. With the help of Cyber Burn, I’ve fixed some of the biggest offenders, but this may still occur. Restarting the game or your computer tends to help for a time. Extended play sessions tend to be the culprit. This should be much less common now, however. The last mission in the Iron Man campaign is bugged and won’t end properly. I can’t figure out the issue, but as it is the last mission, you can still play the entire campaign. This is not your average mod. It has a total of 10 campaigns, 7 full length and 3 mini-campaigns (which might get expanded in the future)! Playing them used to be a bit complicated, but thanks to Abenavides, it’s now just a matter of clicking on the appropriately named .exe included in the mod folder. Each of these launches the game with the appropriate campaign loaded. The rest of the game is the same, so you can play in the RR with the full cast of characters with any and all of the game modes. This just changes the campaign missions available to you. If for some reasons the .exes don’t work for you, you can still access all of the campaigns manually. Simply choose the campaign you want out of the ‘Campaigns’ folder, copy it, rename the copy to campdef, and drop it in your main MA folder, rewriting the exiting one. Don’t forget to copy these, or you’ll lose campaigns! It’s done! Welcome to Adventure in the Marvel Universe! 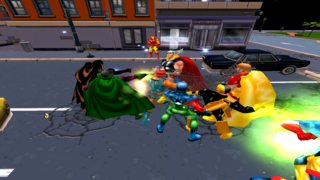 This is a gigantic mod that encompasses large swaths of the Marvel comics universe. 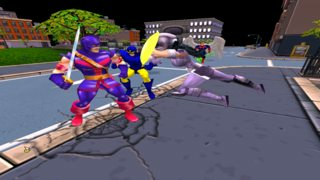 It attempts to capture the classic feel of a large assortment of characters with new stories set during the heyday of such icons as Captain America, Thor, the X-Men, the Avengers, and the Fantastic Four, as well as a bevy of villains and guest stars. 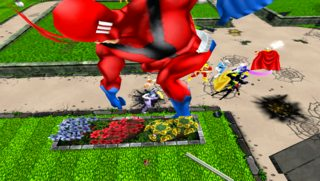 This mod gives you control over some of your favorite superheroes and lets you fight for justice in four color glory! Included you will find a total of seven campaigns for a wide variety of characters and teams. You can face the villainous Hellfire Club as the X-Men, or struggle to save all of the nine realms as Thor and his allies. 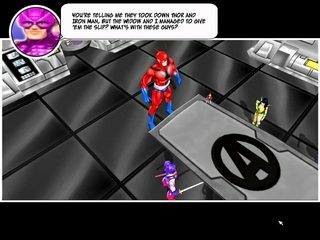 Check out the Marvel Adventures Album HERE! So, what are you waiting for? Join the fight! This mod is akin to my massive DC Universe According to Grey, though on a much smaller scale. I have not tried to capture the entire width and breadth of the Marvel Universe, just my favorite corners thereof. 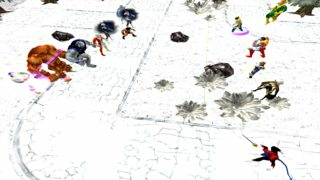 You’ll still find a very large mod here, with most of the classic heroes and many of the classic villains of the Marvel Universe. On the other hand, this mod embraces a similar design philosophy to the DCUG, not trying to completely capture any interpretation of the Marvel U., instead trying to create an idealized version, something of the best of all worlds, in my opinion. It is most closely based on the Bronze Age, but I took liberties to clean up continuity or for the sake of the story I wanted to tell. Keep in mind, not all of the campaigns tell complete stories, and all of these are intended to be expanded and continued. In the future I’ll add a Spider-Man campaign, Dr. 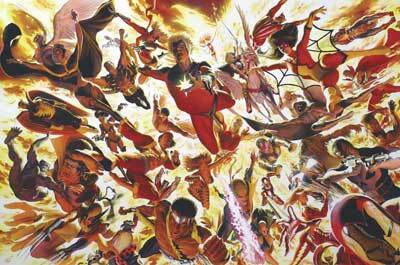 Strange, perhaps Captain Marvel, and others. Hello friends and fans, I’m sorry for the long silence, but hopefully what I bring with my return will go some way to assuaging any bad feelings about my absence. I’m afraid that last year was nothing short of terrible, and we in the Grey household have been working hard to make sure that 2011 turns out to be a better one. It was a long semester, but now I’m enjoying something approaching a summer vacation, and although my blog may have been dormant, I have not. Since my last releases I’ve been working on a half dozen projects or so, and I’m still going to keep most of those secret for the moment. A few of these are obviously the finished versions of mods I’ve already released, but there are several more that I just about can’t wait to reveal. I’m hoping they will really send some waves through the community. In fact, I was simply going to sit on all of these secrets until I was ready to release, but a post someone made on Tomato’s excellent discussion board (which is serving as an interim home for the Freedom Reborn crowd) provided me with simply too much temptation. A community member started a thread asking if anyone was working on any Marvel mods, and another member very kindly mentioned that he hoped to see one like my little DC project, the DCUG. Well, some time passed with no one really answering these guys, and I just couldn’t take it anymore. So, I released some teaser shots of one of my projects, the one I’m working on at the moment. 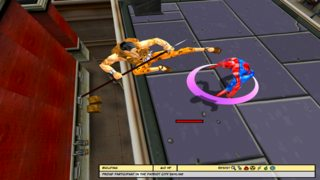 I still don’t want to say too much, but it is going to be called Marvel Adventures, and those of you who have been following my blog, such as it is, may find some clues about this mod in one of my ‘From the Ether’ posts. I will tell y’all that this mod will include several different campaigns with a wide variety of characters. If you are the observant type, you probably already have a pretty good idea of some of the roster. Let me reiterate something, though. This project will most certainly not be of the skope of the DCUG. I’m afraid I’m not up for another 3+ year project! I hope that folks will find plenty here to enjoy, though. But why talk you to death when I can show you some screenshots of your favorite characters in action? All images on this blog are copyright of their respective owners. This is a non-profit site, just fan-work, and no infringement is intended. I'm a professor of medieval literature who studies heroism, and interestingly enough, I'm a big fan of superheroes. Go figure. I love adventure stories of all shapes and sizes, whether they are about Achilles or Aquaman.